Description: The Chinese-made Spyderco Tenacious makes owning a high-quality knife much more affortable than ever before. 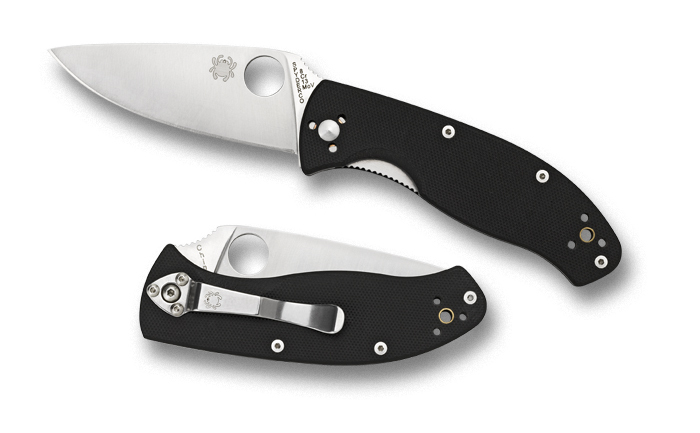 With High-Impact Fiberglass laminate G-10 Scales, and a 8Cr13MoV steel blade, the Tenacious takes styling cues from the Manix, but gives it all in a package that retails for less than $55. This entry was posted on Tuesday, December 22nd, 2009 at 9:42 pm	and is filed under 3" to 4" Knives, Designer - Eric Glesser, Designer - Sal Glesser, Features - Black Coated Blade, Features - Screw Construction, Handles - G10, Lock - Liner Lock, Manufactured - China, Steel - 8Cr13MoV, Type - Folding Knife, Type - Utility Knives, Type - Value Folder. You can follow any responses to this entry through the RSS 2.0 feed. You can leave a response, or trackback from your own site. Was the Tenacious ever produced with a light blue fiberglass laminated G10 handle?